There are 4 single column ties that we regularly teach at the IFA and one that has been a favorite of mine since I learned it is the Wyk'd Dave Wyk'd Fast Bowline. Wyk'd Dave is an incredible rigger and rope artist from England. If you haven't checked out his websites- http://rope-topia.com/ and http://wykd.com/ you owe it to yourself to. It is a wealth of information and some amazing images of spectacular rope. He devised this single column tie to be a quick way to start a takate kote (aka box tie, or gote, or tk, etc) but of course it can be used in any application that a single column tie would be used. I really like the speed and simplicity of this tie. It goes on fast and is incredibly secure yet it is easy to remove when you are at that point. It is without question my favorite way to start gotes. There is a bit of a downside with it though but that is easily overcome when you understand it. The Wyk'd Fast Bowline is very directional. This means that the standing end of the line (the part toward the tails) needs to make a 180 degree turn. The illustration to the left shows this. With a shorter rope of 10 or 15 feet this is not a big deal but when dealing with a much longer rope of 25 or 30 feet it becomes much more problematic. To avoid having to fold a longer rope back over itself start with the working end (the bight) going behind the column being tied. If you do that then the standing end of the line will be draped in front of you and can be folded up into the tie easily. Start by wrapping your column twice with your rope. Leave about a hand's length of the bight to complete the knot. Fold the standing end of the rope back over itself 180 degrees. Pass the working end of the rope over the wraps and the bight formed by the standing line. Note that I am holding the standing line bight open with my finger. Pass the working end bight underneath all the wraps. At this point the tie will look like this. I took this picture to show the open bight on the Standing end of the rope. Pass the working end bight through the standing end bight as shown. Pull fairly tight. Pull on the standing end of the rope to tighten up the knot. Dress it to make sure it is set properly. When completed the Wyk'd Dave Wyk'd Fast Bowline look like this. It should be fairly "square" in appearance. for suspension applications it would be wise to have a longer bight of 3-4" in order to "lock" it off for safety. The completed Wyk'd Dave Wyk'd Fast Bowline from the side. 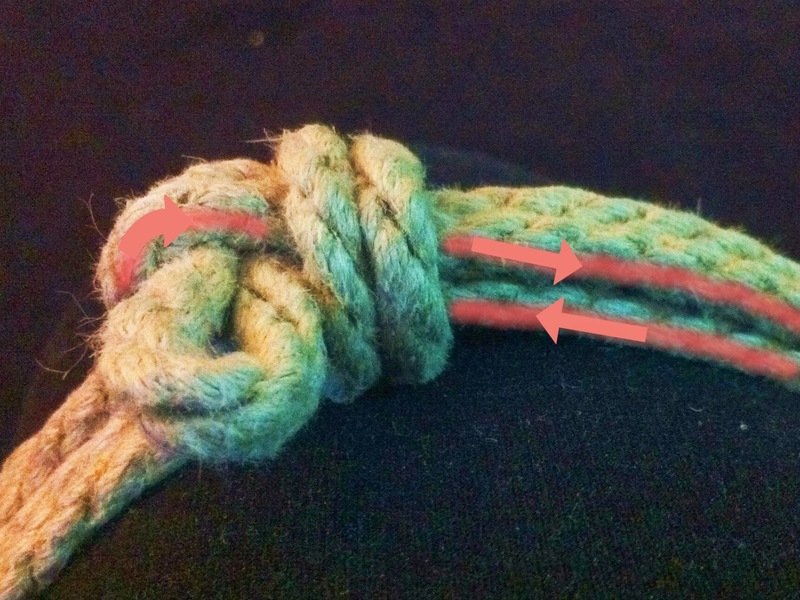 Here is a variation of the traditional futomomo that addresses two common issues with this tie: #1 we prevent shin pain by starting the tie around the arch of the foot instead of the ankle and #2 we redirect the top cinch line down below the first one so you don't have to struggle with stuffing rope between the calf and thigh. The "foot"-omomo is a great tie for creating a sense of vulnerability and exposure for the bottom. It also immobilizes your play partner and can work well for suspensions if tied securely. Begin with a Lark's Head Cuff. Refer to Tracker's earlier post to see how this is done. Now make a reverse-tension double column tie. Begin by wrapping around the thigh and shin. Reverse direction and wrap around the shin and thigh. Be sure not to cross the ropes or leave any gaps. Once you bring the rope around the thigh, pull the rope through the bight. Now pass the rope between the calf and thigh. Pull the rope out the other side of the leg. Wrap the rope around the bands and pull it between the calf and thigh back to the other side. around the bands and coming out between the cinch line and the shin. Create a bight pointing up toward the knee and bring the rope behind the bands. Pull the rope through the bight to tie off the cow hitch. Your finished cow hitch should look like this. Bring your rope up the leg and make an "L" to begin a single column reverse tension tie. create the first loop in the reverse tension tie. Wrap the rope around the calf and thigh in the opposite direction and pull through the bight. Your reverse tension single column tie should look like this. ankle since that's the direction that we're going next. Pull the rope through the bight to cinch off the reverse tension tie. Bring the rope down around the double column tie. Pull the rope out the opposite side of the leg. Bring the rope up and pull it underneath the upper bands on the leg. Pull down to begin the finishing cow hitch. Bring the rope underneath the upright line. Create a downward-facing bight and bring the rope around the bands and down through the bight to create your finishing cow hitch. Voila! You have yourself a fancy shmancy "foot"-omomo!